Students in London discovered a previously unobserved supernova in one of the Milky Way’s neighboring galaxies this week and it is bright enough to be seen through a small telescope. The supernova is located in galaxy Messier 82 and is about 12 million light years away from Earth. Supernovae are exploding stars caused either by a collapse of the star’s core or a resumpion in nuclear fusion there. They often emit so much light and radiation that they are more visible than the galaxy in which they occur. 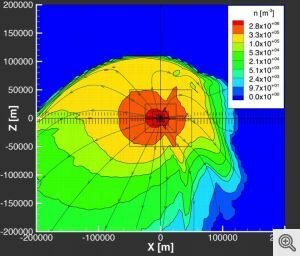 Some supernovae are so potent that they discharge more energy during the period in which they are visible than our sun will produce in its entire history. The show does not last forever, though. Supernovae, once the energy visible in the aftermath of the explosion begins to dissipate, become remnants. 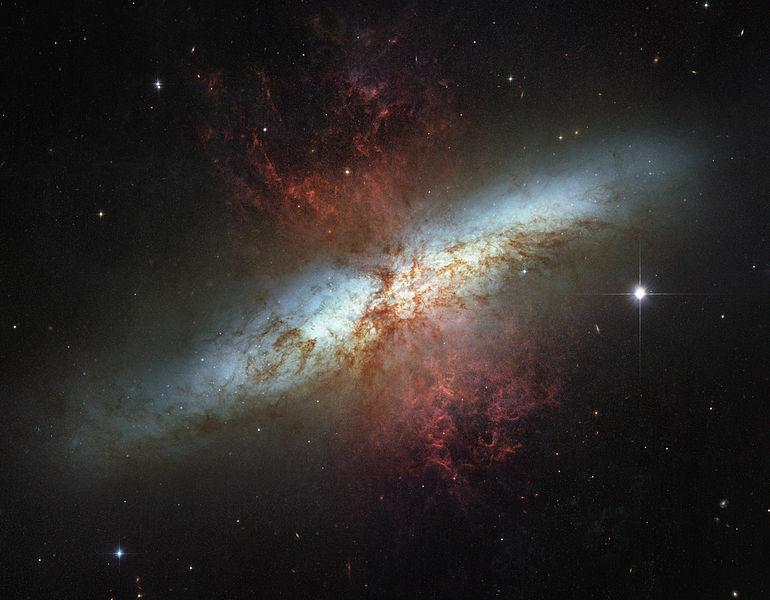 The M82 supernova was an accidental find. 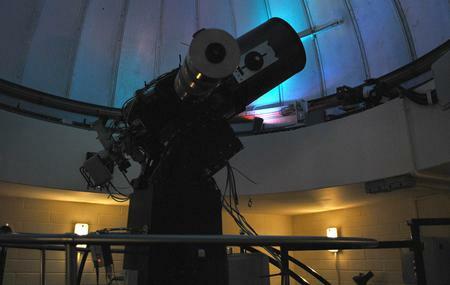 Undergraduates in a workshop aimed at learning how to operate the CCD camera on an 0.35-meter telescope. They aimed the telescope at M82 because it is well known as a visually interesting target for night-sky watching. Their teacher, Steve Fossey, saw something that he did not recognize from prior observations. Not being sure what it was, Fossey compared the image he took with the onboard camera to a digital archive. Because clouds were rolling in, the group did not have much time to continue observations of the new phenomenon. So they obtained a number of long exposure images through a variety of filters, which would be helpful in determining the object’s brightness. They also imaged the object with a second telescope so that any flaw with the automated controls or other instrumentation on the first telescope could be ruled out as a cause of the “star” they had seen. Fossey then alerted astronomers around the world, including the International Astronomical Union’s Central Bureau for Astronomical Telegrams. The CBAT catalogues supernovae. The M82 supernova, now known as SN2014J, is the closest supernova discovered since 1987, when Supernova 1987A was identified. That supernova is about 168,000 light years away. SN1993J, another supernova that is about the same distance away as SN2014J, was discovered in 1993. The team of students who first saw it were surprised by their find. “One minute we’re eating pizza, then five minutes later we’ve helped to discover a supernova,” one of them, Tom Wright, said. Messier 82 is formally identified as NGC3034 and popularly known as the “Cigar Galaxy.” It is five times more luminous than the Milky Way galaxy. This mosaic image of M82 was obtained by the Hubble Space Telescope. Image courtesy Wikimedia. These two images show the Messier 82 galaxy on, respectively, Dec. 10, 2013 and Jan. 21, 2014. Notice the bright light in the lower image. Images courtesy University College of London/University of London Observatory,. Photography by Steve Fossey, Ben Cooke, Guy Pollack, Matthew Wilde, and Thomas Wright. 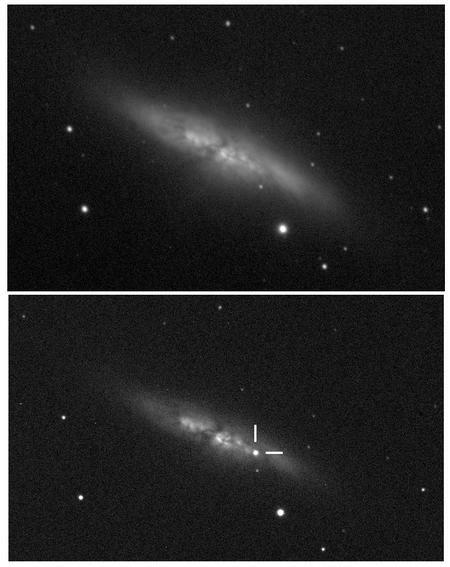 This image shows a Celestron C35 telescope used by students at University College of London and University of London Observatory to discover supernova SN2014J. Image courtesy University College of London. Photograph by O. Usher. This mosaic image was taken on Jan. 4, 2004, by the navigation camera on the Mars Exploration Rover Spirit. It shows a 360-degree panoramic view of the rover on the surface of the Red Planet. Spirit operated for more than six years after landing in January 2004, driving 7.73 kilometers (4.8 miles), more than twelve times the goal set by mission planners. Spirit was the first robot to reach the peak of a hill on another planet. Even after the machine’s right front wheel failed in 2006, Spirit explored another half-mile of Mars’ surface. 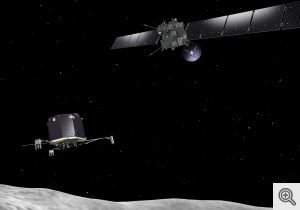 Spirit transmitted to Earth more than 124,000 images, ground material from the surface of 15 rocks, and prepared 92 other surfaces for inspection with spectrometers and a microscopic imager. Spirit’s sister rover, Opportunity, is still active on the surface of Mars. You can see highlights of the Mars Exploration Rovers’ mission at http://mars.nasa.gov/mer10/. Image courtesy NASA, Jet Propulsion Laboratory. Winter started in the northern hemisphere, and summer began on the southern half of the planet, more than two weeks ago, but today marks Earth’s closest approach to the Sun during 2014. Our planet reached the perihelion of its orbit at 12:00 UST (5:00 am MST). At that time the center of Earth was 147,104,780 kilometers away from the center of the Sun. Earth does not orbit the Sun in a circle; instead, the planet follows an elliptical orbit. That means we are at times closer to the Sun and at times farther from the Sun. The point at which we are the farthest from the Sun during the year is called aphelion. The two benchmarks of Earth’s orbit do not fall on the same day each year. 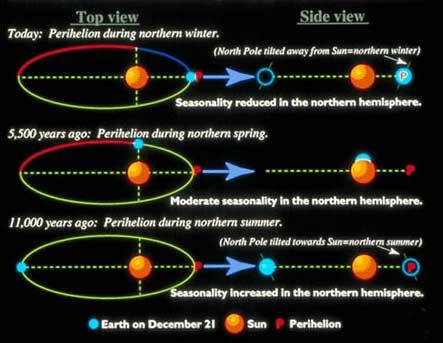 In fact, perihelion aligned with the winter solstice in the northern hemisphere back in 1246 AD. The two events will not again occur on the same day for a very long time. In fact, in the year 6000 AD perihelion will occur on the same day as the northern hemisphere’s spring equinox. Perihelion occurred on the summer solstice about 11,000 years ago. By the way, seasons on Earth have very little to do with the planet’s distance from its star. We experience winter, spring, summer, and autumn primarily because Earth is tilted on its axis. Aphelion comes in early July, when Earth will be about three percent farther from the Sun than it is today. 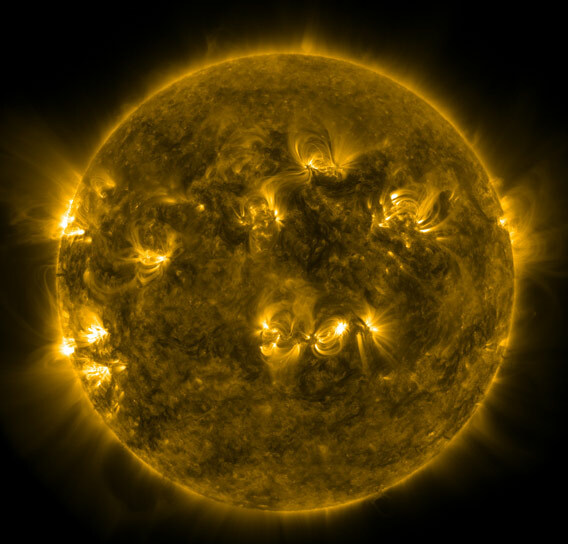 The Sun at Earth’s perihelion on Jan. 2, 2013; Solar Dynamics Observatory image courtesy NASA. The new year will be graced quickly by two new moons, as January will see them occur on New Years Day and again on Jan. 30. It will be four more years before two new moons in one month will be seen again, as that situation will not recur until January of 2018. Both of the new moons occurring this month are so-called “super moons,” so named because Luna is at or very near the closest point to Earth that it ever reaches in its orbit. This post at Skywatch includes an image of the New Years Day new moon provided by the U.S. Naval Observatory.